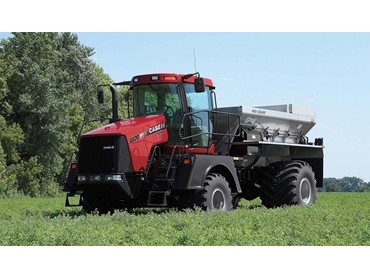 Case IH introduces the brand new Titan 4020 floaters to its product line-up. The 305 HP Titan 4020 floaters are designed to operate in rough conditions, going where modified road trucks cannot. Titan floaters allow farmers to enter very wet or steep paddocks to spread fertiliser without compacting or roughing up the soil. Case IH Product Manager, Ross Johansson says that the Titan is ideal for fertiliser spreading in any weather. He adds that there has been an increased demand for floaters designed specifically for agricultural applications. Modified road trucks typically used by many broadacre farmers and contractors consist of wide tyres placed on the trucks with a fertiliser bin on the back. The Titan floaters are purpose-built machines with a number of advantages over modified road trucks. Ross adds that Case IH is in discussions with various local manufacturers to ensure that they can offer customers a complete package customised to their individual operation. The Titan uses the same cab, bonnet and engine as the extremely popular Case IH Steiger tractors, making them even more attractive to Case IH customers. The commonality of parts, according to Ross is a key advantage as it makes them very cost-effective to own and maintain. Titan floaters are being considered for versatile applications in diverse environments. While broadacre farmers and contractors as well as dairy farmers use Titan to spread dry and liquid fertiliser, sugarcane growers in north Queensland plan to use the floaters as haul out trucks. Additionally, construction contractors see the potential of the Titan as water trucks on site.